Test drive our tech. Click to access online resources now. The California website is designed specifically for California Educators. We offer information regarding Pearson Programs & Solutions aligned to the Common Core, CA Pathways Blueprint initiative, CA-Approved Math Programs, and CA-Funded Intervention Programs. 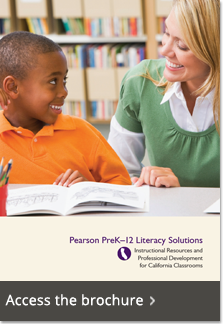 Check out our CA literacy programs!